Candid talk with Priyanka Chopra. It's been a great year for Priyanka Chopra. She made heads turn with her American telly series Quantico and garnered critical acclaim with her films, Dil Dhadakne Do and Bajirao Mastani. Even though Sanjay Leela Bhansali's epic film revolved around the love story of Bajirao and Mastani -- played by Ranveer Singh and Deepika Padukone -- it was Priyanka's Kashi that enjoyed centrestage. Priyanka discusses her success with Rediff.com contributor Rajul Hegde. Did you expect this kind of positive response for your role as Kashibai? The film is primarily Bajirao and Mastani’s love story. Kashi is someone history has forgotten. She touched my heart when they narrated the story. I always knew Kashi would be an integral part of the love story. People call me Kashibai when I land at the airports. It's wonderful! Even when I was in Montreal, it was wonderful to get that reception. But I didn’t expect this kind of love and appreciation. When I reached home, it was like a garden. I thought it was my birthday. Did you ever worry that you played the second female lead, and that it might be risky? I am not a competitive but a collaborative actor. I believe that only when people come together, they make a good film. If I am the only one doing good work in the film and the film doesn't work, it's of no use. The length of the role doesn't matter. I had eight scenes in Kaminey but they were so impactful. At the beginning of my career, someone said there are no small roles, there are only small actors and I’m not a small actor. Ranveer Singh received a hand written letter from Amitabh Bachchan. What’s the best compliment you have got for this film? All of us have got compliments from Mr Bachchan. Whenever he sees good performances, he sends hand written notes. My mother collects them as she is a huge fan of Mr Bachchan. She can’t talk when she stands in front of him; she judges my performances on Mr Bachchan’s notes. Over the years, it has become a tradition. I did not expect this kind of response for my role of Kashibai. It has become like a milestone. (My) roles in Aitraaz, Fashion, Mary Kom, Barfi! and now Kashibai in Bajirao Mastani will be remembered by people. It's wonderful to see the unanimous kind of love and adulation that I have got for Bajirao. There are a bunch of films that have been offered to me. I can’t commit which one I am doing. There are few really amazing scripts. I have lot of choices, but not much time. I can do only two films next year, between India and America, and it's difficult to decide. Quantico has got extended so I am caught up with it. We have dubbed the show in 44 languages and have got a good response. They have increased 13 episodes to 22. Hopefully, we will get renewed for a second season. I have not been approached for Sultan. You didn’t do anything on Indian television after Khatron Ke Khiladi. Do you plan to do anything on Indian TV? I did Khatron Ke Khiladi only because it was for 20 days. I can’t do anything now unless it is something quick. I don’t have time even for my music. My production house Purple Pebble Pictures is very important to me and it slowed down because I am travelling. When I launched my production house, I had said that I want to work with new talent. I want to promote regional cinema. We are developing three stories right in various languages with new talent -- not just actors but directors, writers and musicians. I am working on Hindi scripts too. 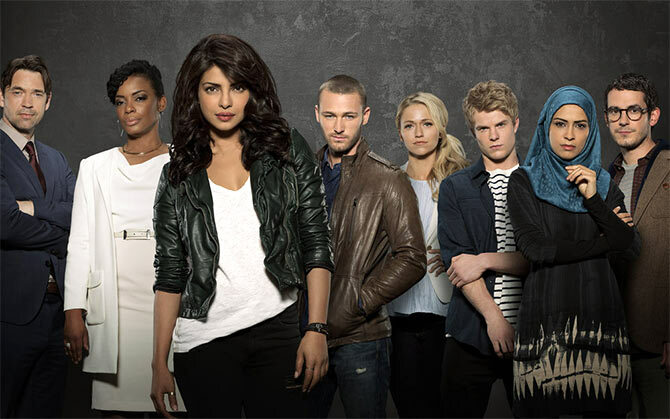 Do you miss home when you are shooting for Quantico in Canada? Living at home is something else. I feel like I am living in a hostel there. I miss the smell, the noise. I am very desi. I have taken my cook there and I eat Indian food every night. I have to eat anda (egg) paratha on Sunday. That is my gift to myself. I am an Indian no matter where ever I go. My entire cast and crew gave me surprise during Diwali. They dressed up in Indian clothes during the lunch break, and danced to Bollywood songs. There were about 300 people and yet, they kept it secret. They have no understanding of Diwali but they did it for me. I did a Christmas wrap-up party at home for the whole group. It’s wonderful to have that kind of cultural exchange. Yes, I'm most excited. It's a very relevant film. It talks about the plight of farmers and the increasing corruption. It is also on gender equality. My character stands up against the odds and wants everyone to treat her for her capabilities. I have always believed in that in real life too. Treat me on merit and not because I am a girl, or because I know you.